Your IT infrastructure is an important business asset. It serves are your company’s communications backbone. With that, you must find strategic methods to guarantee its health, stability, and security. One effective way to achieve this is by hiring a managed service provider (MSP). Managing your own IT infrastructure is not just expensive, but it is also unpredictable. Many unexpected IT costs can occur at any time. This can affect the whole budget of your entire IT environment. But by hiring an MSP, you will be able to control your IT costs. With the help of an MSP, you can also eliminate the need for an internal IT staff. Having your own IT team results in higher labor costs. Moreover, you need to invest time and resources for IT staff training. MSPs guarantee its clients high-grade managed IT services. They will offer all these services in exchange for a fixed monthly rate. This service charge will also cover IT systems maintenance. This way, you can ensure that you can maximize the use of your IT budget. When you hire an MSP, they will take over all your IT functions. In line with this, it will also be in charge of providing you the IT tools and solutions to use. To ensure top-notch quality IT services, an MSP guarantees to use only the best technologies possible. Managing a business IT network is not simple. It needs advanced technologies to be successful. With that, MSPs strive to maximize the use of their resources. This allows them to ensure that they can quickly acquire new tools and solutions that are specifically designed to serve business-level networks. With that, you can guarantee that these technologies will suffice the need of your infrastructure. MSPs also invest in nurturing the IT expertise of their respective organizations. They ensure this through providing their specialists with regular technical training. Through this initiative, MSPs assure that their IT team can gain up-to-the-minute network management knowledge and expertise. This allows MSPs to provide services that align with current industry standards. By hiring an MSP, you will have a reliable IT team that can keep up with your growing IT needs. System requirements of your network may increase over time. But with the help of an MSP, you can ensure to receive IT services that will suit with your ever-changing IT needs. With scalable IT services, your infrastructure will be able to handle evolving business demands. This allows you to maintain smooth day-to-day operations. MSPs aim to keep your IT infrastructure up and running. One way to ensure this is through strengthening your IT security. An MSP will set up well-planned IT security strategies. This will make the security of your infrastructure more rigid. With that, you can ensure that all your endpoints will remain safe and secure. This guarantees that all network devices and sensitive business data are protected. By hiring an MSP, you will be able to focus on your core business needs. Building your brand, improving operations, and nurturing your customer relationships must be your focus. By relying to the services of an MSP, you will have a reliable IT team to deal with all your IT challenges. ➔ One efficient way to ensure a healthy environment is through outsourcing all your IT functions to an MSP. An MSP will take over all responsibilities with regard network management and monitoring. ➔ Hiring an MSP will allow you to experience better network management and monitoring service. MSPs use only top-class tools and solutions. They also provide you with qualified tech specialists. Through these, MSPs guarantee to keep your network healthy and secure. If you are looking for a reliable provider of high-grade IT services, you can check out thinkIT Solutions. Since 2001, thinkIT Solutions has provided best-in-class products and solutions to fit your specific needs. With that said, thinkIT Solutions provides the best IT Solution New Orleans-based businesses deserve. 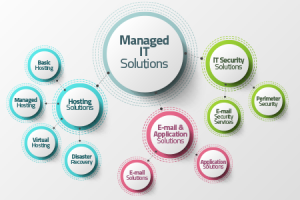 Know how to have an efficient managed IT services. Call thinkIT Solutions now at +1 (504) 455-5552!